We took a month long break from our homeschooling in the late summer. I used that time to do a lot of organizing around our house. It felt so nice to get things back into order and come up with some new ideas for how to organize and hopefully stay organized through the busy school year. I thought I would start by showing you a simple organizing project that took me maybe 10 to 15 minutes to complete and has helped keep the girls bathroom better organized. 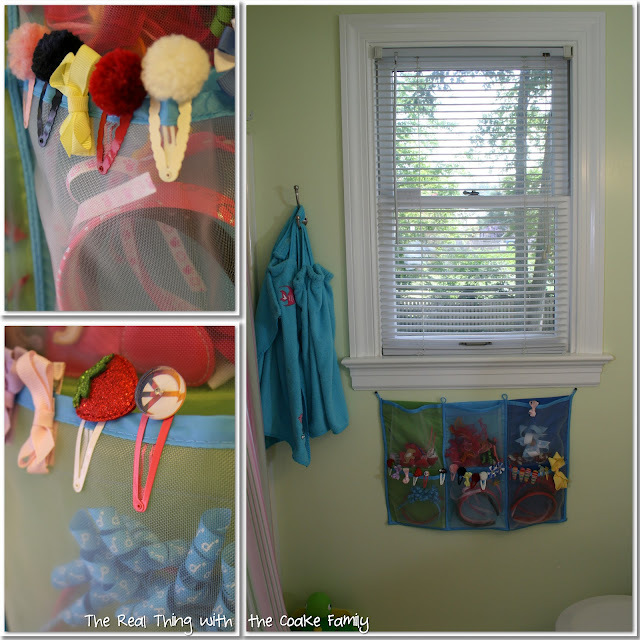 When we took a trip to IKEA probably 6 months ago, I found this Kuisner organizer for $3.99. I wasn't sure what it would be used for, but I thought it might come in handy and for only $4, why not pick it up and figure it out later, right?! I found my use for it, organizing all my girls hair clips, bows and headbands. I have tried a few different ways of organizing their clips, bows and headbands and none have worked so that the girls saw them, used them and could actually manage to put them away. Mr. T hung this up for me in their bathroom. The colors aren't exactly the same as the colors in the bathroom, but it does have the one green section that sort of goes with the wall color. The girls also have bathrobes that are the color of the organizer, so it all blends together even though the main colors are the green and pink. As you can see above, we have used the pockets to hold the head bands and the clips/bows. The girls are able to clip the smaller hair clips onto the tops of the pockets. I love that it is easy to see what we have and easy for the girls to find what they want. They also seem to be able to put things back where they belong thus far. Of course this isn't everything we have. In one of the bathroom drawers, we have our small clips and hair bands along with two headbands that were ‘too special' or might get smashed in the organizer. 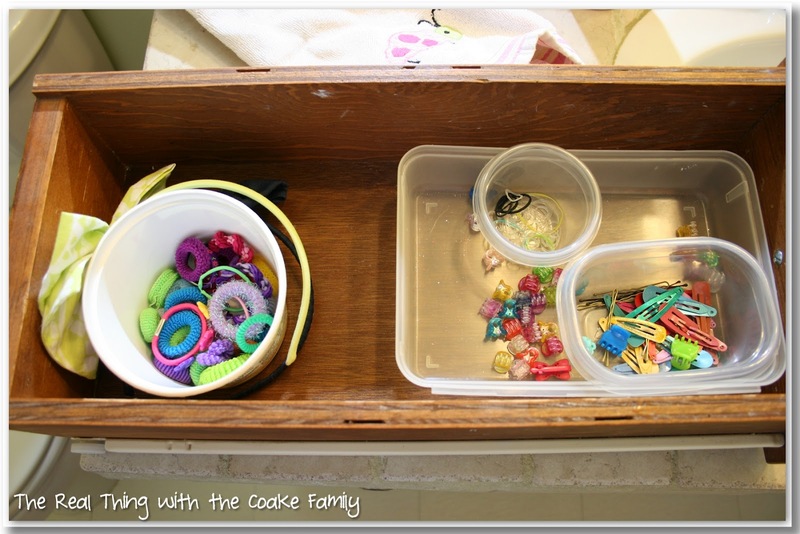 We started with this set up…I'm showing you it even though we changed it a little bit because it shows the full picture of the drawer with the headbands and the container with the ponytail holders. Here is what we settled on. 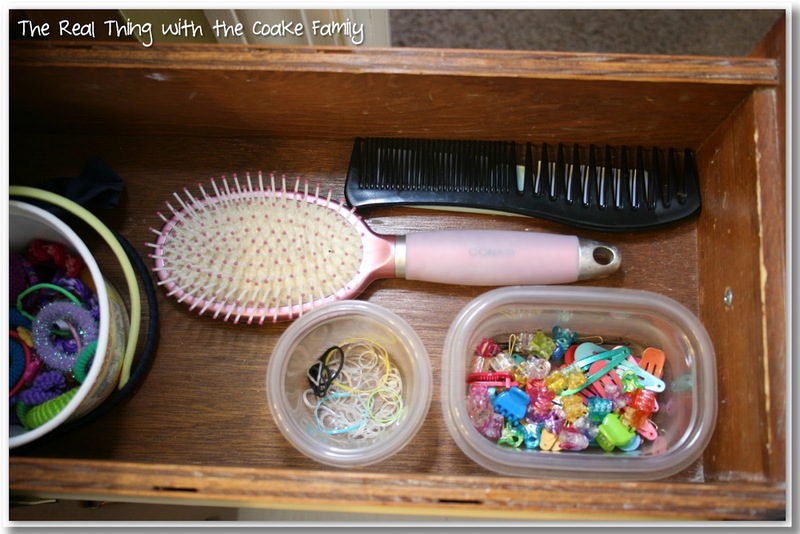 The brushes/combs have their own space, with containers for the ponytail holders, elastic bands and the small clips. This drawer does not look quite this neat on a daily basis, but overall the girls are able to keep up with it in a way that we can find what we need. There you have it. 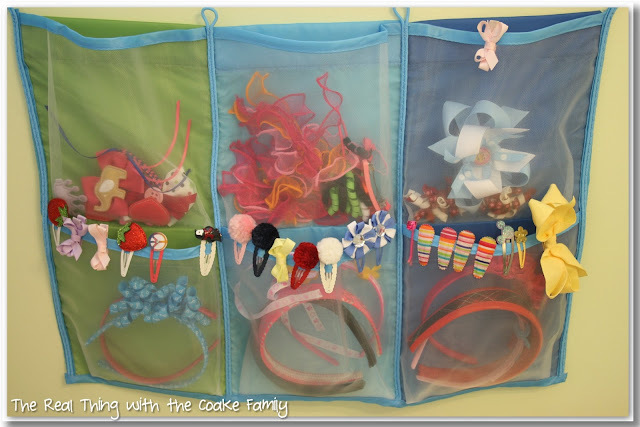 A simple and inexpensive way to organize all those hair clips, bows, headbands, etc in a way that the kids are able to see them and put them back where they go. Love it! That is a great idea! Thanks so much for sharing it. Sounds like it is functional and I bet it looks pretty, too! Thank you! Yes little girls do seem to have so many hair things…they can get to be a bit too much. Had to find a way to wrangle everything.